I agree that it’s very important, as educators, to focus on the internalisation of motivation without our learners, opposed to merely trying to push them to be motivated. Learners should pull motivation from their own schema…we should not have to force it down their throats. I also feel that full motivation in learners cannot be simply achieved through out actions. Although we definitely should have a part of this process, the student’s outside life and environment definitely affects their ability to be motivated. Those students with support systems and reward systems at home are going to come to school already with a basis for motivation. These students may just need a little nudge in the right direction. It’s the students who have no basis for motivation and no support system outside of school that can be a real challenge. Are there specific ways to help these students become motivated? Obviously, different strategies would need to be employed for different types of students and different age ranges. However, I wonder if there is a generic instructional strategy? 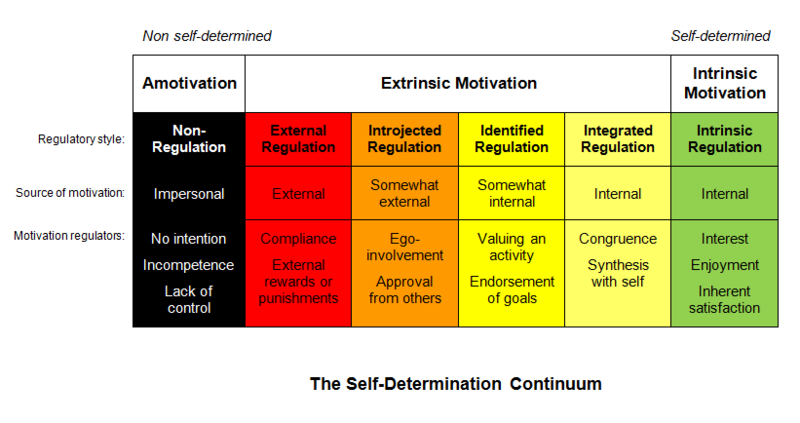 I just stumbled upon this when I was looking for a diagram of the motivation internalisation process. Glad to see that I made some impact! 😉 What a great blog. I love your entry on cognitive load theory, too! Glad you found my blog! You certainly made some impact and if it wasn’t for your class, I may never have heard of SDT. Thanks for the feedback, hope things are going well with you.